ATHENS, Greece (AP) — At least 11 migrants died in the eastern Aegean Sea Wednesday in five separate incidents, including a large shipwreck from which 242 others were rescued by the Greek coast guard. The coast guard said it remained unclear how many people were on the wooden boat when it capsized and coast guard boats, a helicopter and vessels from the European border agency Frontex searched through the night in stormy seas for more survivors. Two young boys and a man died in that incident, but their nationalities were not yet known, it said. The International Organization for Migration said in a statement some sources told it 200 people were on the boat when it went under, while others had told it 300. Fishing boats and coast guard vessels ferried survivors to the port village Molyvos on Lesbos, a few miles away from the Turkish mainland. In makeshift shelters, volunteers and doctors offered assistance. Many women suffered from shock or hypothermia and received first aid in a chapel at the port. 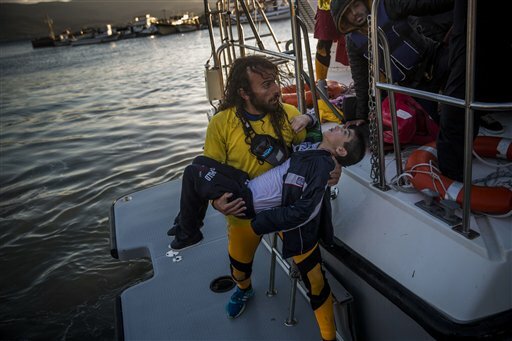 The accident raised the total death toll in the eastern Aegean Sea Wednesday to 11, as thousands of people continued to head to the Greek islands in frail boats from Turkey despite worsening weather conditions as winter set in. Greece is the main entry point for people from the Middle East and Africa seeking a better future in Europe. Well over half a million have arrived so far this year. Earlier Wednesday, a 7-year-old boy died off Lesbos while a 12-month-old girl who had been on the same boat was in critical condition in hospital. Another three children and a man died off the coast of Samos, while one woman and two children drowned off the islet of Agathonissi. Greece’s merchant marine minister, Thodoros Dritsas, expressed sorrow about the deaths and called for more coherent European Union policies to stop migrants risking their lives by paying smuggling gangs to ferry them to Greece in unseaworthy craft. “The coast guard’s admirable, constant struggle to rescue refugees at sea is, unfortunately, tending of late to turn into a constant and agonizing operation to locate and recover drowned refugees,” he said. Tags: Athens, fishing, Greece, International Organization. Bookmark the permalink.